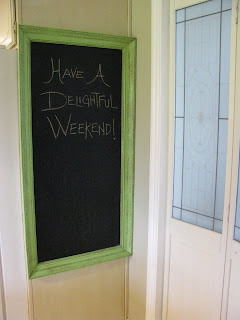 As I've made my visits around blogland, I've noticed that making your own chalkboard is quite a popular project. Not wanting to be left behind, I purchased a large piece of framed art. I cleaned it well and then covered the "painting" with newspaper. 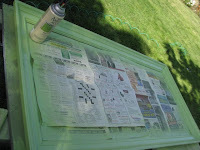 I painted the frame a pretty apple green. I've been wanting to use this color on a project since seeing it at the paint party. It really is a cheerful color. When the frame was dry I covered it. 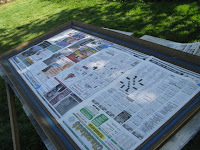 (Hint- Be sure there are no gaps where paint over-spray can sneak in and land on your freshly painted frame.) 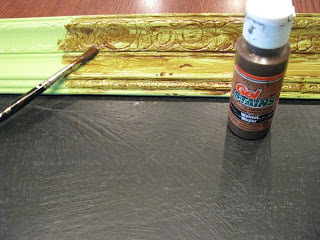 Next, I covered the painting with two coats of chalkboard paint. 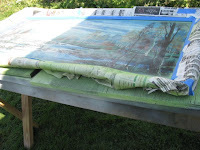 I let it dry for 24 hours then I rubbed the entire board with the side of a piece of chalk to break it in. I painted a stain on the frame. I like using these little stains that you can find in the craft store. They're water soluble and easy to work with. I worked in small sections at a time, making sure the stain gets into the details. Then I wiped off the excess. This gives the frame some character and the look of age. I want the piece to look like I picked it up at an expensive antique shop. All that was left was to hang it in a prominent place in my kitchen. My art had a brush stroke texture to it which means my chalkboard does too. I'm not sure if I love the textured look or not. That's something for you to consider if you're going to try this project. And you should try it, because everybody's doing it! I've been planning a chalkboard project as well. I haven't had the time to get to it though! I love how yours turned out, very pretty with the green! how stinking CUTE! i love the detail that showed up when you used the stains! what a great and easy idea! Thanks for sharing. I haven't really figured out how to do those stains until now. Nice chalkboard. It looks good I have one in my kitchen and love it! I love the color! I can actually say I did this!!! I just have not hung it up yet :) I really like the green! I really like this,,,you did good. I didn't even know there was such a thing as chalk board paint and I'm married to a painter...lol What a great idea ..thanks for sharing. I've done one too. Thanks for the tip on the stain. I have been trying to figure out how to get that look. "Everybody's doing it"...Laugh Out Loud!!! That's exactly what I said in my post about the dead black Halloween tree I made (when the couple at the city dump wanted to know why I was taking dead stuff home). Hee-hee. Your project turned out fabulous!!! This is so much cuter than the one I bought for too much $$...great idea! Oooh, I can just see you scratching a note to yourself about ingredients for a fabulous recipe, or a reminder to your boys to put the trash out! Turned out fantastic and I would never have thought to cover up a HIDEOUS painting! Clever, so clever. Love the color and I think I'm digging the texture too. It's unexpected and I like that! Can one have too many chalkboards?!? I hope not because I can't even count how many I have!! I love your big one!! So cute! Joy, I love the chalkboard! Also, I finally blogged about my Dollar Tree three opening frame: http://lemonadehere.blogspot.com/2008/10/kudos-to-bloggie-girls.html. I'm so happy with how it turned out! Thank you for always sharing your projects. 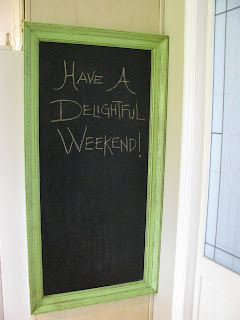 I love chalkboard paint! I just did a post on my kitchen and some jar lids that are sprayed in paint. I have yet to do a big piece yet though. Thanks for the inspiration to do so! Ok that turned out so great! I love that apple green, that was the color of my old kitchen, so Happy! So clever to use those stains too...I really want one now! I have an extra cabinet door I'm going to try that with....thanks for showing it!!! I LIKE the texture....more vintage looking. I now so want to be everyone. Great project Joy...and I have just the frame (or two or three) waiting in the garage wondering what I'm going to do with them! 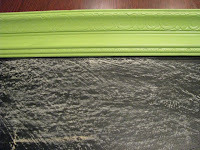 I LOVE the color of your frame and yea, I don't have to copy since I have already done 3 chalkboards! I LOVE them!! Yours turned out GREAT! What a lovely, happy green chalkboard. I love it. I need to come to your garage sale.. I love everything you do Joy! yes everybody is doing and..
but your's is a one piece black board..and this makes it unique..
What a great project, someday I'll make one. I have so many projects to do, some half-finished! Never enough time. I love all your furniture redos! So pretty! I just found your blog. I LOVE all of your repurposed furniture and decor. I am just getting ready to get adventurous with spray paint, myself! Thanks for the inspiration! That's really cute, Joy. I must be the only one left without a chalkboard. I do have a bulletin board though...a huge one. Love that limey green spray paint. I've used some before too. Hey Joy! Guess what? I have the exact same project posted today! Great minds think alike! Actually, mine has an antique gold frame, so it's not EXACTLY the same, but pretty close. It even has that brush stroke texture, and like you, I'm not crazy about the texture. Love that lime green color you used! Love the chalkboard. Fun, fun color. I love mine, and now i want to do another one in a different color for my laundry room. They are totally addictive. Love it!! I really appreciate the details of how you make things. I have so many new projects to try. Have a blessed day. love the green frame! very cute! I love it! That color of green is just like my kitchen but a little lighter! That is great! love love love it!!! LOVE THE TEXTURE, TOO!! Go to my blog...I GAVE you something! I have been looking for something like this. I never thought of an old painting! Great tip. I already have the paint, and the frames....no...just...do...it!! :) Love the green! Have a wonderful weekend, Joy! What a great idea! I have seen the chalkboard paint at Home Depot. I might have to pick some up next time I am there! that green and that stain...oh so pretty. love it. what a great piece! love your blog. i am so glad i found you on "huse blog" great stuff. Love the apple green! I am contemplating using chalkboard paint on the panels of my new kitchen door. It is not old enough to be OLD and not new enough to worry about...not to mention it has a dog door already cut in it! I love, love, LOVE it. I too am jumping on the chalk board paiting bandwaggon. I just can't figure what to do. Wish me luck. LOVE it, of course! I did a chalkboard in our kitchen for our son, but on the wall. I framed it out with molding so it looks like it's hung. ;) Sneaky. You did a great job on this. I recently posted about my chalkboard collection, one of which is an old '60's print of a painting that I spray painted over and got results much like yours with a little texture. But I like it just fine. Glad to see you tried this and that it worked! That is so great! Thanks for taking the time to show us how to do it. Now I'll be on the lookout for a piece of art. Love it! 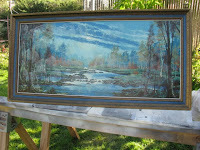 The reuse of an old painting is simply brilliant!! And, it's hot =] I am sooooo going to have to store this idea away! This is the first time I've visited blog land in a long time, and you were my first stop! glad to see your neew projects!! Dad wrote a comment on my blog!!! What is this world coming to?! JK it was a pleasant surprise. I love chalkboards...the green is great! I love the chalkboard, I did one a while back (not sure if I had met you in blogland then) and I was really pleased with how it turned out, and funny that we use it all the time, the kids write little messages on it and reminders, so I was thinking of doing another one, I like the green on yours, nice touch, I also like the size of frame you chose, I will look out for a similar one, that's if I don't drive-by one! Joy, thank you for popping by for a visit. No, the keys that are pictured on my blog are not mine, it's just a photo. I do love old keys and doors and door knobs and I can often be found admiring them at the monthly flea market. I'm glad you liked my post about simplicity - it is something I'm striving for. I hope you'll pop by for a visit again. Come by for a visit when you have time...I have something for you! AWESOME!!!!! I love the color too!! Hey, wanted to tell you I got my Boo frame done!!! gave you credit of course too!! Thanks!! Heck yes I need one of these! Love it! I guess I'm going to have to make one for myself. Funny thing I must be on trend. I just did this a week ago I just haven't posted it yet. I like your frame much betterthan mine! I am going to have to try the stain stuff. I love the look. Very cute! If only I had old art laying around. My friend made a chalk board table for her son and she used spray chalk board paint and said it was easy. Maybe it wasn't your brush, but the old oil painting that already had texture? Still it turned out great! I love this! The apple green especially! I'll add it to my "to copy" list! Ha! Beautiful! Can you paint that on a mirror? I do have a mirror that I am not using. love it! i just did the same with 3 different pieces of "art" that were unwanted at my house. the apple green is beautiful! This looks like a project I could actually do. Are the brush strokes on the chalkboard really a problem? I'm just wondering if you could replace the canvas with something else and paint that with chalkboard paint. Now I really want to try using stains! This is SO cute. You did a great job! I was wondering something.. (hopefully it hasn't been asked before..I didn't make it all the way through the comments)..When you paint on the chalkboard paint, does the surface become magnetized? Like could I put magnets on it? Hopefully this wasn't a silly question..just wondering. That is such a great idea! never would have thought of that! thanks for sharing! ps I love your blog! Love it. Like the painting technique. 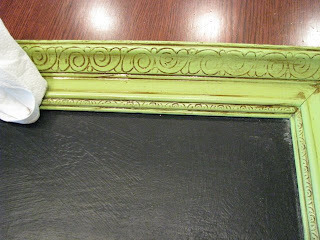 I made a chalk board last week with a large oval frame that I found in the Thrift store I will post it soon.